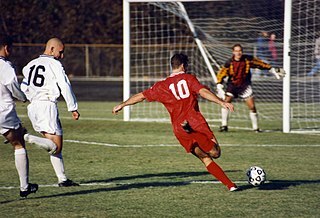 Mariusz Lewandowski (Polish pronunciation: [ˈmarjuʂ lɛvanˈdɔfski] ; born 18 May 1979) is a Polish retired footballer and current manager of Polish side Zagłębie Lubin. The Piłka Nożna Magazine Plebiscite is an annual plebiscite organized by the magazine journalists of Piłka Nożna, the Polish football magazine. Participants choose the best player, best newcomer, best team, best coach and best foreign player in Polish football. Legnica(listen) is a city in southwestern Poland, in the central part of Lower Silesia, on the Kaczawa River and the Czarna Woda. Between 1 June 1975 and 31 December 1998 Legnica was the capital of the Legnica Voivodeship. It is currently the seat of the county and since 1992 the city has been the seat of a Diocese. As of 2017, Legnica had a population of 100,324 inhabitants. In July 2010, he signed with fellow Ukrainian Premier League side PFC Sevastopol. On 27 November 2013, he left the Crimean club. Mircea Lucescu is a Romanian football manager and former player who was most recently in charge of Turkey. Dmytro Anatoliyovych Chygrynskiy is a professional Ukrainian footballer who plays as a centre back for AEK Athens. Igor Duljaj is a Serbian former professional footballer who played as a defensive midfielder. He is best remembered for his tenacious playing style and stamina. Jádson Rodrigues da Silva, professionally known as Jádson, is a Brazilian professional footballer who plays as an attacking midfielder for Corinthians. Răzvan Dincă Raț is a Romanian professional footballer who plays as a left back. Luiz Adriano de Souza da Silva, or simply Luiz Adriano, is a Brazilian professional footballer who plays for Russian Premier League club FC Spartak Moscow as a striker. 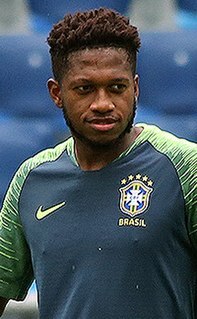 Ilson Pereira Dias Júnior, commonly known as Ilsinho, is a Brazilian right midfielder who currently plays for the Philadelphia Union. Ilsinho originally started his career as a right back, but during his time at Shakhtar Donetsk he was used as a winger, where he showed off his skill and speed. Willian Borges da Silva, commonly known as Willian, is a Brazilian professional footballer who plays as a winger or as an attacking midfielder for Premier League club Chelsea and the Brazil national team. Marcelo Martins Moreno, known as Marcelo Martins or Marcelo Moreno, is a Bolivian professional footballer who plays as a striker for China League One club Shijiazhuang Ever Bright and the Bolivia national football team. Serhii Andriyovych Kryvtsov is a professional Ukrainian footballer who plays as a defender for FC Shakhtar Donetsk in the Ukrainian Premier League. The final of the 2008–09 DFB-Pokal season was held on 30 May 2009 at the Olympiastadion, Berlin. Werder Bremen won with a 58th-minute goal from midfielder Mesut Özil. This was the club's sixth DFB-Pokal in its history, after victories in 1961, 1991, 1994, 1999 and 2004. This was Bayer Leverkusen's DFB-Pokal final loss of the decade, the other occurring in 2002. Werder Bremen lost the 2009 UEFA Cup final ten days prior to the DFB-Pokal final, losing to Ukrainian side Shakhtar Donetsk. Adnan Kovačević is a Bosnian-Herzegovinian professional footballer who plays as a defender for Polish club Korona Kielce. ↑ "Shakhtar Donetsk 2 Werder Bremen 1: Match report". The Guardian. 20 May 2009. Retrieved 14 December 2018. ↑ "Lewandowski zmienia klub" (in Polish). Onet Sport. 27 July 2010. Retrieved 14 December 2018. ↑ "Poland". FIFA. Retrieved 14 December 2018. ↑ "Poland squad for Euro 2008". The Guardian. 28 May 2008. Retrieved 14 December 2018. ↑ "Ukraine - Poland". FIFA. 11 October 2013. Retrieved 14 December 2018. ↑ "Steven Gerrard goal against Poland ensures England will go to World Cup". The Guardian. 15 October 2013. Retrieved 14 December 2018. ↑ "M. Lewandowski". Soccerway. Retrieved 3 June 2017. ↑ "Player of the year » Poland". World Football. Retrieved 14 December 2018. Wikimedia Commons has media related to Mariusz Lewandowski .